When locating a modular data center in a remote area, at the edge, or locations that require enhanced enclosure performance, there are few options (if any) that can take a bullet like the Binary Bunker. What makes the Binary Bunker's MDC enclosure so special? Reinforced, light-weight concrete and here's what you need to know. Seems like an oxymoron to say "lightweight" concrete but there is a way to get the best attributes of concrete without sacrificing anything except weight. Call us, we'll explain how! With lightweight concrete modules, you can take full advantage of concrete’s strength, long life and resistance to the long term effects of the weather. The shelters are pre-assembled, reinforced solid concrete panels welded together to form a single, high strength, module. 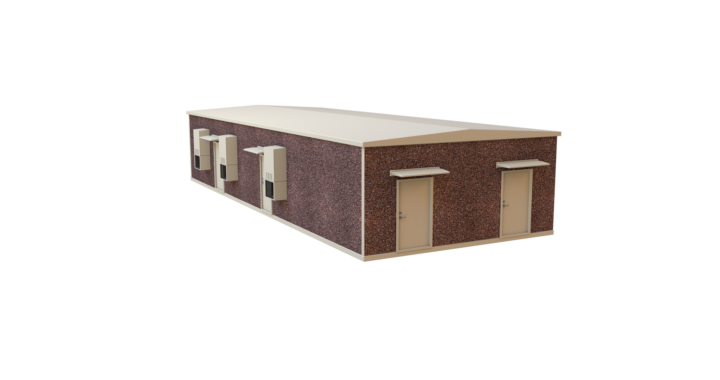 The walls, roof, and floor panels are triple sealed for superior weather resistance and welded together creating a single, high strength module. The completed module is inherently bullet, vandal, fire resistant and thermally efficient. The standard 4-inch wall construction provides a 2-hour fire endurance rating which is recognized by the SBC, UBC, and BOCA codes. In edge computing environments reliability, stability and longevity is everything! Edge Mission Critical Systems is a formal consortium of best-in-class manufacturers and service providers organized under one roof serving as your single point of contact and one-stop-shop for modular data center projects. Edge Mission Critical Systems specializes in providing you with the best in class modular systems that form the backbone of data centers and critical backup infrastructure. You want an experienced partner and we are experienced in supporting organizations such as commercial and private data centers, healthcare facilities, government and municipal facilities, and numerous other industries. Our team works with clients and the engineering community to establish designs that are the most efficient and practical for our client’s specific operational needs. We evaluate and study these needs, geographical locations and environmental characteristics prior to engaging in design methods to ensure we provide our clients with the best possible solution. While we utilize an agnostic approach to equipment selection, we also offer pre-configured systems with paired components that have proven to provide the best reliability. If one of our pre-configured systems are right for your needs, you can take comfort in the fact that they are scalable, efficient, secure, and provide tremendous value with low total cost of ownership. We have developed strategic relationships with several of the top equipment manufacturers and provide industry leading technology. To provide the highest availability of power for your electrical requirements we offer our Tier 4F engine generator solutions, rotary UPS systems, and power distribution solutions. We also offer cooling/chiller solutions and modular data center solutions. Our superior hot and cold aisle containment solutions and energy efficient In Row Cooling systems are designed with our intelligent cabinet platform to provide state of the art solutions to maximize your cooling infrastructure and lower your PUE. From engine generator to computer rack, EdgeMCS offers the best possible solution for your needs. Knowledge is Power, EdgeMCS delivers both!